In October 2016, Dolma Impact Fund invested in a pharmaceutical company- Rhododendron Biotech Pvt. Ltd (RBPL) and acquired a 49% stake. In October 2016, Dolma Impact Fund invested in a pharmaceutical company- Rhododendron Biotech Pvt. Ltd (RBPL) and acquired a 49% stake. RBPL’s key products are Haemodialysis Fluid, Rectified Spirit and Distil Water. They plan to expand their product line by manufacturing Tablets, Capsules and other External Liquid Preparations. 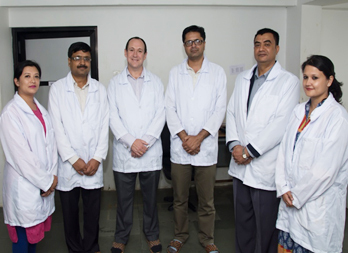 RBPL is the first company to manufacture Hemodialysis Fluid in Nepal. This investment will provide not only employment opportunities to a skilled and semi-skilled workforce, but also will contribute towards import substitution of the country by expanding their production facilities. Since DIF’s investment, the company has created jobs for 70 people.